Shastar Naam Mala is a composition written by Guru Gobind Singh Ji. In it Guru Sahib Ji envokes the Almighty by describing Him through names of weapons. Much of the composition is in ‘Braham gian’ and says that everything is as it is, according to the Almighty. “You are the one who causes conflict and yet You are the one on hand to resolve the whole situation.” Again Guru ji says, “You O’Lord are Sri Raam Ji, You are Bhagwan Krishan Ji, You are the incarnations of Vishnu, You are Bawan, You are Buddha.” A hard concept to understand for many questions arise. The way to resolve this is to emerse yourself in the bani of Guru Granth Sahib Ji and only then can the true meanings be understood. In the wrong hands weapons can be a source of tyranny and oppression, but here Guru Ji is using the names of weapons as a source of inspiration, liberation and self pride. For too long the people of India had lain prostrate as wave after wave of conquorers from the north-west came and looted their homes and families. Here, Guru Gobind Singh Ji is giving these people their self worth, their pride. Guru Ji asks the Almighty to protect him and to destroy his enemies and oppressors of the poor and needy. Literally translating to ‘string of weapons’, this is a comprehensive list of weapons used in battle and covers many verses. Many names of weapons are given in addition to references of great warriors (historical and mythological) who wielded them. Many weapons that were in their infancy at the time of the Guru, such as cannons and rifles, are also mentioned. Guru Ji uses weapons through which to worship the Almighty. – You are the death, you are the destroyer of death, You are the Tegh and the Arrow. Your ultimate goal is victory and today, You are the ultimate warrior. A description of some of the weapons used in the prayer. Only the introduction portion of Shastar Naam Mala has been reporduced below. The chapters after this deal with specific weapons -Chakar, Talwar, Barsha, Arrow and Gun among others. The one (and only) Savious – Unique Lord – victory to thee. Invocation to Sri Bhagauti (the eternal and infinate supreme power of God) for assistance. The narration (bani) of the tenth Master, Guru Gobind Singh Ji. 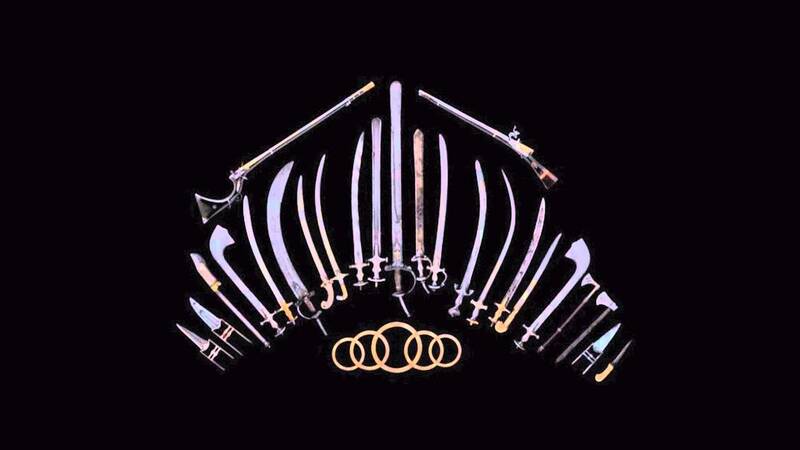 Spear, Sarohi (special sword made in Sarohi, Rajasthan) , Saif(stright sword), Asi (curved sword), arrow, gun and Turwar (sword), Satratak (sword -destroyer of the enemy) , kavchantak (armour piercing sword) (all these weapons kindly) protect me. Asi, Saif, trident and Jamdaadh(dagger with two blades). Kavchantak Satrantak (lrage sword), tegh (broad sword) , arrow and sword that cuts the torso. You are the arrow, spear, battle-axe and sword. Whosoever contemplates on your name crosses the ocean of life and death. You are death and you are the destroyer of death, Kali , and you are the sword and the arrow. You are the emblem of victory and the bravest of warriors in the universe. You are the trident, spear and battle-axe, the quiver and the arrow. You are also the dagger, lance, karad (small knife) and the sword. You are the armament, sheild, armour and the quiver. The sword is your image and you are universally present. You are the supreme and doer of everything and you are the essence of knowledge. You represent all and confer liberation upon them. You are the day and you are the night and you are the granter of life. To perform miracles you incite them to quarrel amoungst themselves. Ari, khanda, kharag, saif, tegh and talwar. Alwars protect us O armour breaking sword and karwar. You are the katar, bichhua and the arrow. (Please) let me prostrate at your feet, and protect me as your (humble) servant. You are the baank, mace, dagger, battle-axe and the sword. You are the dagger and spear – kindly protect me. All these names – knife, sharpened small knife, karad( small dagger) , dagger, bugda (a curved cutlass). Please help me from all the worldly illusions. You initially created this universe and then created the (different) sects. You create conflict amongst them and then help them resolve it. You are the incarnation of the fish, tortoise, boar and Waman the dwarf. Narasingh and Buddha incarnations were also yours and you are the sustainer of the universe. You are (Lord) Raam. Siri Krishan and your are the incarnations of (Lord) Vishnu. You are the subjects and you are also the Emperor of this universe. Your are the Brahmin and your are the Kashattria , you are the pauper and the king. You transact unanimity , vanquish them, penalise them and are an answer to everything. You are the head, you are the torso and you are the soul of the being. You have granted the knowledge to (the four faced) Brahma, who has uttered the Vedas. Bisakh (arrow without feathers) , Khatang, Tatarcho(unusual arrow) , all these (kindly) always fulfil my wishes. You are present in the quiver as the susbaan (special arrow with a half moon end), which hunts and kills the enemy and game. You overpower your enemies and then proclaim victory with your sword. You are patis (double edged sword), spear, battle-axe and a mine of miracles. the enemy of the enemy – the sword, khanda, kharag (large sword) and kirpan (sword) are all your names. Jamdhar (a dagger like a tooth) Jamdhara (a double faced blade) Jodhantak (sword and arrow that destroys warriors) – all these weapon names. The warrior who goes into battle without them is badly hammered. Baank (sword), mace, dagger, biaskh (arrow), birha (arrow with feathers) – are all your identity. On the ones your granted your benevolence, they become kings of the world. Shastersar (King of arms), Samrantak (sword, which ends battles), spira (shield breaking arrow) and shamshere (sword). He escapes the net of doom that mentions your name even once. saif (straight sword) Sarohi, satter (sword), Sarangaar (sword, which cuts bows) are all these names. Invariably remain in my mind and constantly comply with my wishes. The Glory of Sri Bhagauti in the first chapter of Naam Malafrom the puraan has been concluded auspicially.